active at night and are difficult to find unless you are listening. Here are tips for ID’ing three owls that are fairly common in their territories in North America – Great Horned, Barred and Saw-whet Owl. When most of us think of the sound of an owl we think of the deep hoot of the Great Horned Owl. Hearing this call is going to be the best way to find these owls as even though they are very large, they do a very good job of hiding – especially during the day. If you live in an area with trees and some open areas in the US, Canada or Mexico, you may very well have a Great Horned Owl near you, as these owls can be found throughout their range. 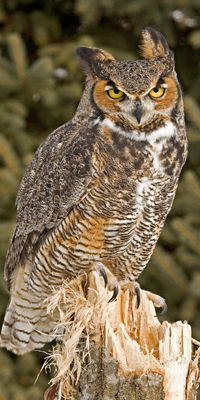 Great Horned Owls are fairly easy to identify as they are generally heard before seen and their call is unmistakable. They are the largest common owl in their range, and have thick bodies, a white bib and long ear tufts. There are other tufted owls in their range, but none this large or brown. Barred Owls, found in the eastern and northwest parts of the US and into Canada, are often heard giving their “Who cooks for you?” call. If you are lucky you may spot one roosting in a tree during the day in mature forests near water. Barred owls can make many different “spooky” vocalizations, including clicks, caws, barks, shrieks, and hoots. Their call is very distinct, and can be easily imitated by humans, often drawing them closer to investigate. Barred Owls are smaller than Great Horned Owls, and lack the distinctive “ear tufts” making them appear “rounder” overall. Their mottled brown plumage transitions to brown streaks on a white belly, and a very recognizable face with a yellow bill and black eyes. 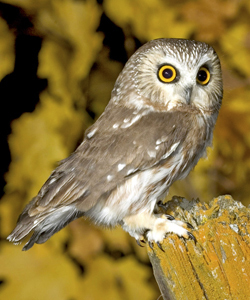 The Northern Saw-whet Owl, the tiniest of these 3 owls, is no larger than a soda can and is common in North America’s northern forests. They have an oversized rounded head with cat-like eyes, a buffy border around their face, and thin white streaks on their forehead. Their body shows brown streaks on the belly and white spots on their back. They remain difficult to see during the day, when they roost in dense conifer trees. Listen for a high, too-too-too call repeated on a quiet night. Saw-whet owls migrate south in the winter, and if you don’t have one in your area, they may be seen at local banding stations as they migrate through. Most owls are more easily heard than seen, but don’t let this discourage you from going out into your local forest and searching for your own family of owls!